There is no Google Play on your Android Smartphone? MoboMarket APK 4.0.8.3 must be the best alternative Android application for you who lost Google Play on Android. Besides has function as same as Google Play, MoboMarket also got many applications that would be not present on the Google Play store. Another amazing thing offered by this app is you will be allowed to download every application that you want without registration. Even it has the same function as Google Play store, it also can be used to kill process and boost RAM at the time. Then, it can also provide Android user to move the application that has been installed on internal memory can be moved to the SD card. Besides can killing process and boosting RAM, it also has the system to clearing off the android file of any kind of junk files that has been not used again. While you are using MoboMarket, there will be the daily updated list of the best and trending application in the market. By using MoboMarket, you will be not worry again to be not up to date on the development of applications. When you have been installing this app, you will know that there are some applications that have been categorizing per genre. There are shopping, transportation, entertainment, business, productivity, finance, tools, social, and travel category. 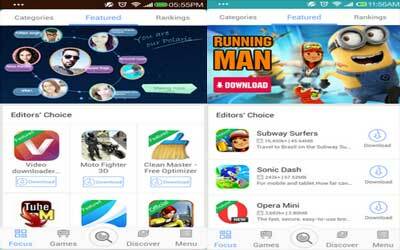 There are also menu features beside categories, to make user easily find the application they want. By the featured and rankings menu, users must be easily to tap the application that they want to install on their Android. While you are downloading the application, you can check the Menu Section which can manage the downloaded applications, uninstall applications, startup optimizer, and even the battery saving options. MoboMarket for Android is the best alternative of Android Smartphone that Google Play store is not available on.